» The buy of the century? The city of Albany wants to sell this old church, which needs all kinds of work. How does this sound like as an advertisement for a property for sale: Has pest damage or dry rot, needs a new roof, is covered with lead-based paint; the main floor beams may need shoring up, the pipe to the sewer main is “reverse grade” (which sounds like it runs uphill), the basement lacks a way for the disabled to get down there, and if you want to make any changes on the outside, you’ll have to apply for approval by the Albany Landmarks Advisory Commission. The city of Albany lists those conditions in the draft of a 17-page request for proposals by potential buyers of an old church at 401 Main St. S.E. 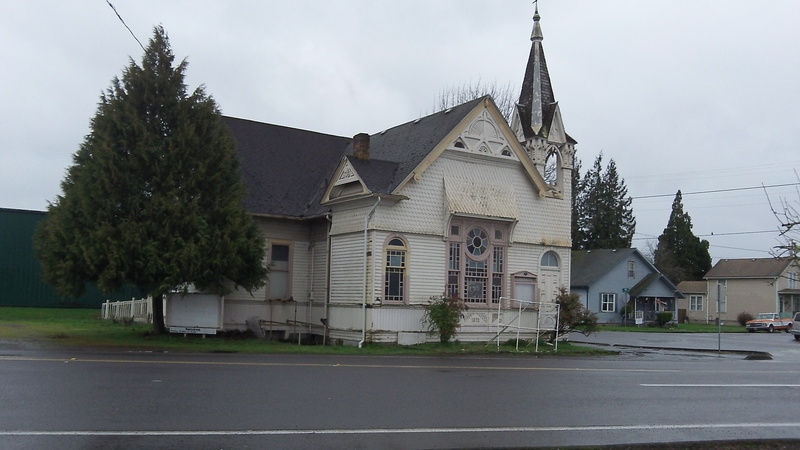 The building dates from 1892 and sits at the corner of Main Street and Santiam Road, next door to the boarded-up Salvation Army thrift store which the city council recently refused to allow to be remodeled as a bottle and can redemption center. The city bought the church in 2000 for $150,000 when it looked as though part of the property was in the way of a planned street renovation. Now the building is surplus and has been empty for years, though the city estimates it has done $5,000 of maintenance in each of the last two years. Now it wants to sell the property as is. On Monday the city council plans to look over the draft of the invitation to buyers. Would-be purchasers would have to, among other things, spell out how they would fix up and use the place, which is in the “Main Street Zoning District,” and how the new use would benefit the neighborhood. They would also be invited to say how much public money they would need from CARA, Albany’s central area urban renewal district. Funny how that’s going to work in order to bail out the city for an ill advised purchase! Maybe it’s time to start firing people for their incompetence. I think it should be moved and the city fix it for use as a community center. Isn’t it historical?